This service provides a convenient way of fullfilling one of the pillars of Islam. Over the past years we have noticed that more and more members are using our service. Because of the importance of zakat, this service is open to all Muslims regardless of whether they are Melayu UK members or not. Eid ul-Fitr (a celebration to mark the end of the fasting month, Ramadan) and Eid ul-Adha are joyous times for Muslims. Melayu UK organises Eid parties on these occasions..
We organise Perhimpunan Keluarga to enable members and their family to get together for a few days for socialising. 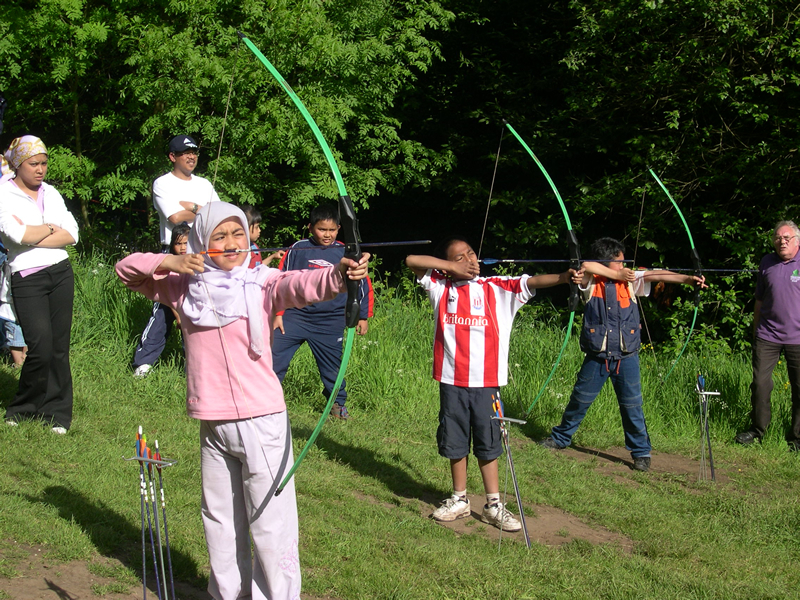 Perhimpunan Keluarga is also packed with various activities such as archery, orienteering, tog-o-war, pioneering and BBQ. Children who have been to Perhimpunan Keluarga still have vivid memories of the enjoyment that they experienced during their childhood years. Counselling services can be obtained from PISANG (Professional Islamic Support and Nurture Group), a Malay-driven not-for-profit organisation. Please visit their website www.pisang.uk for more information. Melayu UK does not charge any membership fee and is dependent on sponsorship for our activities. Please become our sponsors. Malays have settled in the UK for decades. The early Malays came and settled primarily in Liverpool, Newcastle-upon-Tyne and London. Their numbers have dwindled owing to death and the organisations that they formed have either disappeared or is now non-functional. The earliest student organisation KMUK (Kesatuan Melayu United Kingdom) has also died. However the death was not due to the decline in the number of Malay students but was the victim of student politics. Melayu UK has to learn from the failures of earlier organisations. We cannot afford to be engaged in factional or party politics which will divide the members. As such Melayu UK has always been independent of political parties and has never and will never ever aligned itself to any political party. Melayu UK also cannot afford to be an exclusive club of those born in Malaysia as this will lead to natural death. Instead Melayu UK have to embraced the younger generations who were born and bred in the UK as the successor of the current leadership. This society really belongs to them as they are the ones who can truly claim to be Melayu UK. This society will eventually be run by British Malays, not Malaysian Malays. Many of the those who were born in Malaysia still think Malaysia as their home and engaged actively in discussions on Malaysian politics, unlike those born in the UK. There are many Malay students organisation in the UK. However they have unstable membership simply because the membership lifespan of a member is defined by the duration of his or her study in the UK. You can join them but the members will disappear after a few years and every year you will have to know more new members whom you know will soon disappear. Melayu UK is a community of permanent members and is not an organisation for those in transit. As more and more Malays are born in the UK, Melayu UK can only get bigger and become more prominent. We also have to embark on innovative membership recruitment programmes to create and enhance this growth in membership. Our recruitment programmes should primarily target the children and not the adults. The experience and excitement of attending Melayu UK activities during childhood will continue to be sweet memories throughout adulthood and until death. These sweet memories will create a love of Melayu UK that will the motivator for expanding and improving the society. After all, children born in the UK in this age will not experience or appreciate the sweet memories of "Lat the Kampung Boy". If we ignore the social and emotional needs of our children, they will possibly become individualistic in this Western society or they will become active in cyberspace but passive in the real world. Perhimpunan Keluarga is one of our recruitment programmes. It is not just for adults but for the children as well, no matter how old they are. In fact, just like a family outing, the programme is more about ensuring that the children will have fun. As adults, we had our memorable childhood days. It is time for us to create memorable childhood days for the children. Melayu UK is our investment for the future of the children. Our effort is actually “sadaqah jariah” or perpetual charity and we will continue to reap the rewards even after our death. Genuine commitment to make Melayu UK a success can only come from our conscience and sincere intention. With sincere intention, Allah will make it easy for us and we will never be depressed, inshaAllah. Registration for our Perhimpunan Keluarga 2019 is now open. Please make all effort to join the get-together. This is a get-together that will bring meaning to our existence as a community in the UK. It will be a great weekend for all of us. The children who attended our previous years' Perhimpunan Keluarga are still in contact with each other, proving that our community is a permanent community that will outlast our lifetime. You can make payment by monthly installments if you wish. Anybody who would like to contribute to ensure the success of the get-together can contact any committee member. Contributions can be in the form of manpower, financial or materials e.g. foodstuff, items for activities. Please pay your fees directly into our account. The venue is a 15-bedroom country house with 60 acres of land. The building can accommodate 70 people. 20:00 Workshop: "Melayu UK: Moving Offline"
09:00 Cleaning the hostel and packing-up. Those who wish to go hiking (Mam Tor or Kinder Scout) can leave early, packed lunch will be provided. Officially we finish at 12.00 pm on Sunday but those who want to enjoy the Peak District can leave early on Sunday morning. There are a lot of attractions nearby e.g. Blue John Cavern, Speedwell Cavern and Peak Cavern. For those who wish to go hiking, Mam Tor has a 3-mile circular walk. Details of the walk can be obtained here. For the more adventurous, Kinder Scout is an option to consider. This hiking option is not part of the Perhimpunan Keluarga activities. However we will provide packed lunch to those who wish to leave early. We are considering to have an option of hiking at Mam Tor on Saturday. One group will do the Monsal Trail and another group will go to Mam Tor. Alhamdulillah the Jamuan Hari Raya Aidil Adha Melayu UK yesterday went very well. Attendance was much much more than what we expected even though many of our members were on holidays abroad. We are glad with the attendance of members who have missed our events for many years, proving that our members still value Melayu UK even though they have not been active for a number of years. Our membership has been increasing and the uniqueness of Melayu UK is that we are very focused on our target group i.e. Malays who are resident in the UK. There is no nationwide Malay organisation in the UK that can rival Melayu UK. The organisations that were set up by early Malay settlers who arrived in the UK in the 1950s and 1960s have unfortunately become dysfunctional because of the decline of membership. Malay students organisations are dependent on the fluctuating and temporary status of Malay students in the UK. Politically-aligned Malay organisations are subject to political changes and may knowingly or unknowingly promote enmity over unity. Other Malay organisations are very localised and do not have the nationwide appeal. Our focus on resident Malays means that our membership can only increase over time and Melayu UK will progress as the young generation UK-born Malays continues to be more dominant in our activities and leadership. The children who attended our events in the early days of Melayu UK are now adults and many of them have children. Our aim is to pass on Melayu UK to this young generation. Our activities will be geared to make it more appealing to this target group and we urge our members to contribute to make this happen. We have been accommodating different preferences for membership since the start of Melayu UK. We started by having online registration for membership and those accepted were added to the Melayu UK Yahoogroup. As time goes by, with lots of irrelevant postings, many members quit the Yahoogroup and get listed on our ex-directory. With the popularity of social networking, we are now recruiting new members through the Melayu UK Facebook. Not every member has Facebook account and unfortunately our membership register will continue to be on different platforms. Melayu UK have survived all these years even without the need to impose any membership fee. The key to our survival is the sincere help from our members who have put in their time and spent their money to make Melayu UK a success. May Allah protect them, increases the iman, increase their knowledge, reward them with rizq in multiple times of what they have contributed, give them better jobs, make their businesses flourish and give them good health. May Allah strengthen Melayu UK and make our members better Malays and better Muslims and make us become exemplary people in the UK. Amin. Melayu UK has been providing a zakat collection service since 2004. The service has been a great help to our members and also provides a conveniet way of fullfilling one of the pillars of Islam. This is especially true for members who live away from Muslim communities. Over the past years we have noticed that more and more members are using our service. Because of the importance of zakat, this service is open to all Muslims regardless of whether they are Melayu UK members or not. We have also distributed the zakat annually in accordance to the shari'ah. Over the past years, our zakat collection has been distributed to the poor and needy in Southern Thailand. Please keep on paying zakat through Melayu UK as every Sterling Pound collected means a lot to those people. 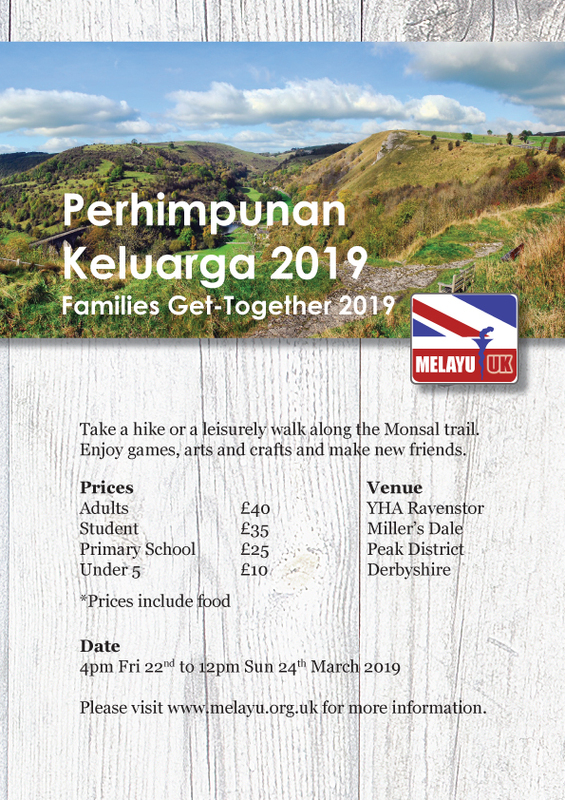 Perhimpunan Keluarga has been one of the key activities of Melayu UK and have brought members young and old together. Through Perhimpunan Keluarga, members have been able to feel and benefit the presence of the other members is a physical setting. Perhimpunan Keluarga, which normally last for 3 days, is normally filled with activities such as archery, orienteering, tug-o-war, pioneering, barbeque. It also enables members to socialise in a welcoming atmosphere, not just through talking but also through doing things together such as preparation of food, organising of activities and empowering the children. Children also enjoyed the various activities amongst them and also showed their talents through activities as well as presentations. We are happy to inform everyone that we will be having a Perhimpunan Keluarga this year. Hopefully the Perhimpunan Keluarga be more successful that those held in previous years. We have invaluable experience in organising Perhimpunan Keluarga in the past and InshaAllah this year’s Perhimpunan Keluarga will be more exciting. As before, we have chosen our Perhimpunan Keluarga venue at a scout camp because of the availability of facilities such as indoor accommodation and a variety of activities. Camping is also allowed for those who prefer the excitement of camping. The president of PISANG, Hamidi Abdul Rahman, was given the honour of delivering a speech to the Patani Malay Youth Association in Europe event on 23rd August 2014. Patani youths from The Netherlands, Germany, Denmark and Sweden gathered in Hamburg, Germany for a 2-day event. This was the first gathering organised by the Patani Malay youth in Europe. The population of Patani Malay youths in Europe is increasing and they plan to organise further gatherings in other cities in Europe. Ramadhan is a time when we try to increase our spirituality. It is a time when we endeavour various struggles and determined to be successful in our endevour in our spiritual journey. We can manage with skipping daily routines such as coffee or tea break. We can afford to miss our lunch even during the long daylight hours of summer but yet we are still carrying our daily obligations as normal. In addition to those, we spend more time at night in prayers in search for more spirituality. Ahli Jawatan Kuasa Melayu UK, Ahli Jawatan Kuasa Melayu UK Youth serta wakil-wakil kawasan mengucapkan Selamat Hari Raya, Maaf Zahir dan Batin kepada semua warga Melayu UK. Semoga hari dan bulan yang mulia ini dapat mengeratkan lagi persaudaraan sesama kita serta meningkatkan komitmen kita untuk mengukuhkan persatuan kita, bak kata pepatah "Yang berat sama dipikul, yang ringan sama dijinjing". Kami mengucapkan Selamat Hari Raya Aidil Adha Maaf Zahir dan Batin kepada semua warga Melayu UK. Semoga hari yang mulia ini akan mengeratkan lagi persahabatan di antara kita. Walau pun Melayu UK tidak mengadakan majlis sambutan secara besar-besaran tetapi kami berharap warga Melayu UK akan dapat merayakan hari yang mulia ini bersama kenalan yang berdekatan. Copyright © 2019 Melayu UK Rights Reserved.